Scary beasts! Flipping kilts! Cavorting goat-men! They're all part of the exuberant worldwide celebration that rings in the new year. 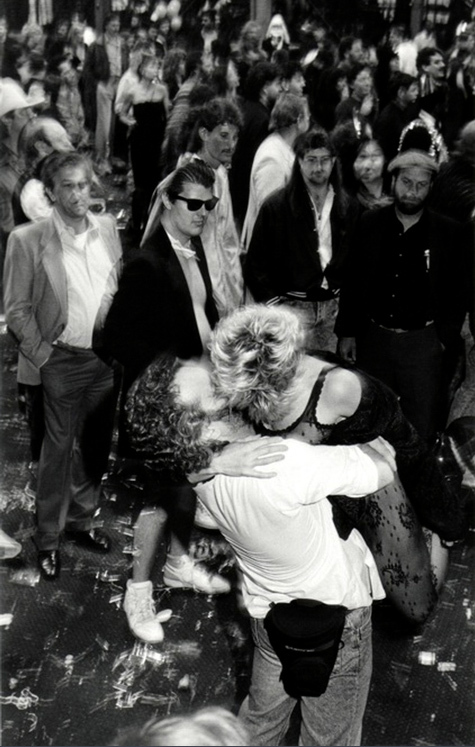 Photographer Jill Waterman talks about her 30 years of capturing the anticipation and the antics of New Year's Eve around the world. 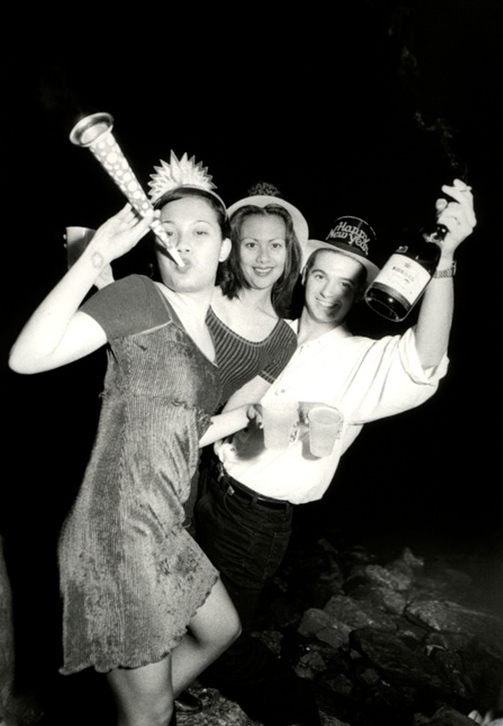 Aimee Baldridge: You’ve been photographing New Year’s Eve in a different location for 30 years now. That’s an impressively long time to sustain a project. Jill Waterman: Yeah, it's a little bit crazy. It has taken me to very interesting places. And it's also a really great time to travel and experience new and different things. It's a nice way to start the year. AB: How did the project begin? Jill Waterman: I was living in Paris, and I didn't really have any plans for New Year's Eve. So a friend and I decided to go out and take pictures. I really enjoyed it, and that's when I got the idea that I could do it every year and travel to a different place, and turn it into a project. AB: At that time you were shooting 35mm black-and-white film. Jill Waterman: Yep. I still am. AB: Why did you decide to stick with film? Jill Waterman: I have an archive of film negatives. I’d like to keep it consistent as long as I can. I do also shoot with a small digital camera. I have Canon G11 that I just throw around my neck. But most of the work I do on this project is with analog black-and-white film. I'm sort of critical of converting from a color original to black and white. I feel if it's intended to be black and white, it should start as black and white. I think the look is different. Bethlehem, 2000. © Jill Waterman. AB: How do you choose the location every year? Jill Waterman: I have a long shortlist, and I'm always looking for new places. So it's a mix between my shortlist and new opportunities. Last year I went to Bulgaria, because I have a friend who's a Bulgarian photographer who was going to be there visiting her family. There's a really fascinating tradition they have in this one town. It was something I had never heard of before, and the opportunity presented itself, so I jumped on it. AB: What is the tradition in the Bulgarian town? Jill Waterman: In Bulgaria there are these figures called kukeri. It's sort of similar to what happens with the Mummers Parade in Philadelphia or with Junkanoo in the Bahamas. And in Bulgaria, it's not specifically a New Year’s tradition. It's more about pagan roots. I think it’s associated with the Julian calendar, where New Year’s falls in the middle of January. So in a lot of places, they have this kukeri celebration in the middle of January. But in this one town, Razlog, they also have a big parade on New Year’s Day, and the kukeri look like the abominable snowman. They're in costumes made out of goat hair, and the person is clothed pretty much head to toe in this goat-hair costume. They have a tall cone head that's a little bit scary and very pagan looking. They wear big bells around their waist that they jump around to shake. It’s meant to scare away the evil spirits. There's a gypsy band and a bunch of other people dress up in traditional Turkish-looking costumes, because that region of Bulgaria has deep Turkish roots. There are seven different neighborhoods, and they all compete in the parade for the best presentation. It's really an amazingly exuberant day of celebration and parading. On the seven nights before New Year’s Eve they also go out and parade around to practice. Each neighborhood has a different night to practice. It's also sort of an excuse to go out and get drunk, because people are drinking and eating special foods. AB: Do you think that New Year’s traditions are sometimes not just about celebration but also about fending off things we fear? Jill Waterman: Yeah. That is sort of a growing trend in recent years, with things like the parade I was talking about and the Mummers. This year I'm going to Austria, where they have these horrific, scary, devilish figures called Krampus. They come out on the fifth and sixth of December, for St. Nicholas Day, but then they also have other creatures called Perchten that come out between Christmas and New Year’s. They’re basically trying to scare the bad spirits away. That kind of tradition, I think, has been really growing in recent years, in different places around the world. AB: Why do you say it's a growing trend? Haven’t those traditions been around for a long time? Jill Waterman: They all have their roots in the distant past, but it seems they have been rekindled recently. A lot more clubs have formed with people who are focused on these little subcultures. Probably the Internet has helped to popularize this kind of stuff, and spread information about it. I don't know if alarmist claims about the end of the world have anything to do with it. It might be a reaction against the ambiguity of technology and everything new, everything being totally clean and modern. It's sort of like a back-to-nature response. AB: How has your approach to the project evolved over the years? Jill Waterman: For the most part, my approach to shooting hasn't changed, but people's relationship to the camera has changed very much. Now people are so camera savvy that it's harder to get unscripted moments. Sometimes at private events people will assume I'm an event photographer who’s going to be giving out or selling pictures at the end of the night. They also expect that they're going to be able to see the picture on an LCD on the back of the camera. There are times when I have to say no to making pictures, because I'm always being approached by people saying, "Take my picture! Take my picture!" AB: Do you carry press credentials? Jill Waterman: I try to. Depending on the situation, I'll try to get credentials or request access at the places I'm going. AB: How do you carry all of your gear and film with you while you’re shooting? Jill Waterman: I carry a backpack, and generally speaking, I'm with somebody else who will also be carrying some of my stuff. Sometimes I’ll make runs back to the place where I'm staying or to store some gear in the car. AB: So for being on your feet with your gear all night, a backpack is best? Jill Waterman: Yeah, I usually have a backpack, and a shoulder bag bedside me. I'll put my Quantum battery pack in the shoulder bag. I’ll put my extra film and lenses in the backpack. Wearing comfortable shoes is important. 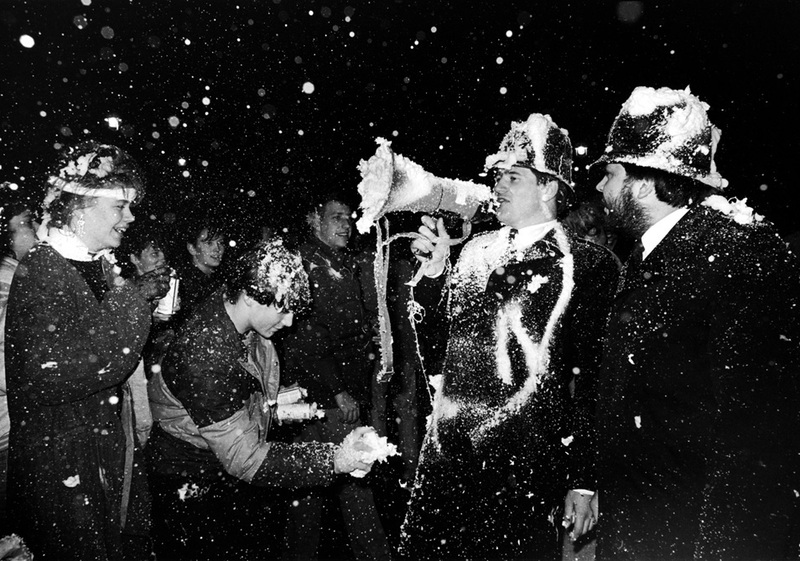 AB: Do you have any other advice for people about taking photographs on New Year’s? Jill Waterman: Plan in advance. See what the location looks like beforehand, and find out whether there are any regulations on photography. If you’re photographing fireworks, catch the beginning of the show before the smoke builds up. AB: How late do you usually stay out on New Year’s? Jill Waterman: I've stayed out all night before. In the Bahamas, there’s this crazy parade called Junkanoo, which starts at 1:00 a.m. and runs until the middle of the afternoon. It's held both on Boxing Day and on New Year’s Eve, so I left for the Bahamas on Christmas night and got there right before the Boxing Day parade started. I went out at 1:00 a.m. and shot through dawn, and they were still parading. At around 10 or 11 in the morning I was still shooting, and getting really tired. All of a sudden I saw this crowd gathered around somebody, and I realized it was one of the guys from the parade who had collapsed with a heart attack. The story was that he had drunk too much Red Bull and rum, and he died on the parade route. I decided I should go back to my room and get a little bit of rest, because I didn't want to end up on the ground too. I got a couple of hours of sleep and went back out in the afternoon, and they were still parading. It was the same thing over New Year’s. It was pretty intense. New Orleans, 1996. © Jill Waterman. AB: Do people drink everywhere on New Year’s? Jill Waterman: Most places. But for the millennium, I was in Israel, and I spent midnight in Bethlehem. It was also Ramadan, so most of the people that were in Manger Square were not drinking on New Year's. It was a mix—Muslims, Christians, and Jews. But the overriding sense there was that people were not drinking alcohol. It was very celebratory, but it wasn't about getting drunk. In Scotland, on the other hand—which is where I was the year before—it was all about getting drunk. Scots are pretty happy drunks, but they are very extroverted. The drunker they got, the more in your face they were. All the guys were in kilts, and everybody was flipping their kilts up—a very uninhibited, crazy scenario. Austin, Texas was crazy in a different way. It's a college town, so there was a lot of stuff happening, and man, talk about drunk. Everybody was really tying one on. That was the most violent place I've been. By 10 o'clock, there was a bar brawl and some guy got all cut up with a beer bottle. Towards the end of the night I got caught up in another bunch of really drunk people. All of a sudden, a woman came running towards me with her high heel in her hand, trying to hit some guy who had decked her boyfriend, who was passed out cold in the gutter. San Francisco, 1991. © Jill Waterman. AB: Do people kiss at midnight everywhere? Jill Waterman: Yeah, although what's really weird now is the phenomenon of cell phones. I think the first time I saw that was in New Orleans in 1996. And now more than half the people are on their cell phone at midnight rather than interacting with somebody in person. They're calling or texting somebody, and having a relationship with their cell phone rather than with the person they're with, which is just strange. I've watched it build over the years. And now of course people are also taking pictures with their cell phones. AB: Are there other ways the holiday has evolved, or is that hard to say because you've been doing the project in so many different places that aren’t comparable? Jill Waterman: That's the thing: I think the places are very comparable. It's the one time when there's this sort of overriding expectation or anticipation about the world going from one year to the next that takes precedence over the fact that somebody's in Pasadena or Shanghai or wherever. The events differ and people's activities differ, but what I'm hoping to capture is that moment of thoughtfulness about the future, and hope for future—the pause that happens on New Year’s. London, 1985. © Jill Waterman. 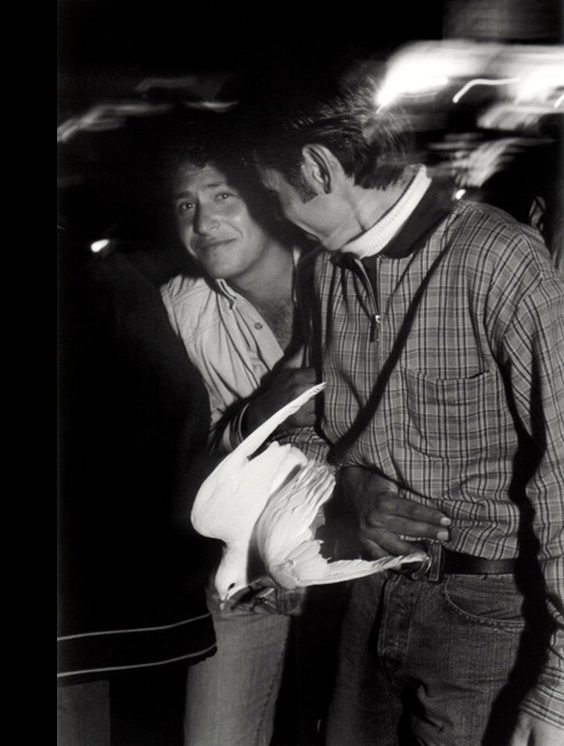 You can see more of Jill Waterman's New Year's photographs on her New Year's Eve Project Web site. To learn about photographing fireworks and other nighttime subjects, check out her book, Night and Low-Light Photography.